Today’s Pick is Beautiful Vintage Holiday Style! 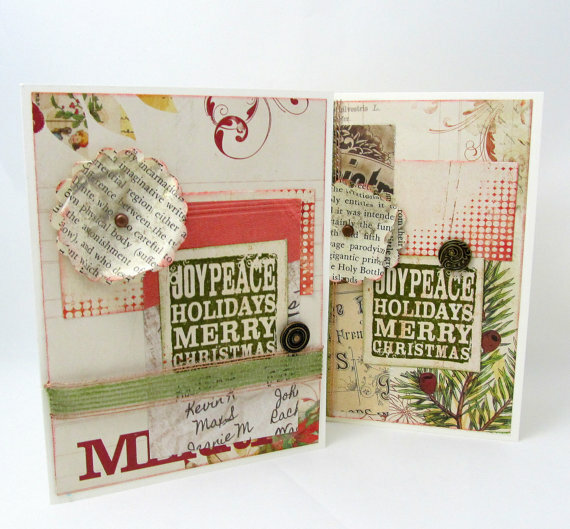 Layers of paper with vintage Christmas imagery adorn an ivory card. A shabby chic flower has been created out of book pages and sprayed lightly with gold ink. The hand stamped message is done in green ink and has a rustic flair. The green burlap ribbon and bronze embellishment give this card lots of charm. The card is blank for you to write a personal holiday message. Size is 4-1/4″ x 5-1/2″ — ivory envelope included.